I have been a fan of Neuro-Linguistic Programming (NLP) for many many years now. Bandler and Grinder really did come up with something special, and had a reasonable theoretical framework associated with their concepts. Much of what they wrote about is continually re-played in the popular and business press, under various headings. If done well, it does not diminish the essential messages nor the utility of what is said. Badly set goals can degrade performance, motivate unethical behaviour and damage organisations. It’s no accident that goal-setting pervades so many areas of modern life. There are hundreds of research studies going back decades showing that setting goals can increase people’s performance. Most have heard the goal-setting mantra that goals should be specific, measurable, achievable, realistic and time-targeted (S.M.A.R.T. ); but few recognise the dangers of poor goal-setting and the unintended consequences that can follow. Here’s how to avoid four common problems with goal-setting, which are highlighted by Ordonez et al. (2009) at the Harvard Business School. If you use goals to effectively tell a university professor that all that’s important is publishing articles, then what is going to happen to her teaching? If you tell call-centre staff that the main thing is how quickly they answer the phone, what’s going to happen to how they deal with the call? Very specific goals can degrade overall performance by warping the way people view their jobs. Better goals: keep them somewhat vague. This gives people control and choice over how they do their jobs. When people are given vaguer goals they can take into account more factors: in short it makes them think for themselves. It’s no wonder that having control is strongly linked with job satisfaction. Perhaps the answer, then, is to set loads of goals which cover all aspects of a person’s work? Not necessarily, as that introduces its own problems. For one thing people tend to concentrate on the easiest goal to the exclusion of the others. For example, in one study participants were given both quality and quantity goals related to a task. When quantity goals were easier to achieve than quality, they focused mostly on quantity. This study is showing how a well-meaning goal can warp people’s behaviour in unintended directions. Better goals: limit the total number of goals. Apart from anything else, who can remember 10 or 20 goals they are supposed to be working towards? Why is it so hard to get a cab on a rainy day? The answer isn’t just that more people are hailing cabs; it’s also that the cab drivers go home earlier because they hit their targets earlier for the day. So Camerer et al., (1997) found in their study of New York cab drivers. This is a prime example of short-termism: goals can make people believe that when they hit their target, they can take the rest of the day (or month!) off. This works at an organisational level as well: if an organisation is continually working to meet short-term goals, it can neglect the long-term importance of innovation and evolution. Better goals: Make sure short-term goals don’t interfere with the long-term vision, otherwise they can be corrosive for the organisation. When goals are too hard, they encourage people to do anything in order to meet them; that includes unethical behaviour. One example of unethical behaviour prompted by poor goals was in the hard disk manufacturer, MiniScribe. Back in 1989, in order to meet financial targets, they began shipping bricks instead of hard drives. The bricks sat unopened for a few weeks in a Singapore warehouse, while Miniscribe successfully invoiced for them. The company soon went into bankruptcy. Miniscribe’s story is also a brilliant example of short-term thinking. What did they think was going to happen when the bricks were discovered, as they surely would be? Similarly, research has also shown that when people are set more difficult goals, they are more willing to take risks. In some circumstances this may be acceptable, but often it is not. Not only that, but goals that are too hard are simply demotivating. How come almost reaching your target feels like failure, even when you’re 99% there? Better goals: Set genuinely achievable goals rather than so-called ‘stretch’ goals. These will avoid encouraging people to behave unethically. All of these problems are further exaggerated by larger the incentives. When there are huge amounts of money at stake, then badly set goals can distort human behaviour even more. So, use these warnings as ways to set better goals, and be careful of unintended consequences. Goals should be somewhat abstract. Goals should be set with an eye on the long-term. Goals should be relatively limited in number. Goals should not be too hard to achieve. Psychologists Mark R. Lepper and David Greene from Stanford and the University of Michigan were interested in testing what is known as the ‘overjustification’ hypothesis—about which, more later (Lepper et al., 1973). Since parents so often use rewards as motivators for children they recruited fifty-one preschoolers aged between 3 and 4. All the children selected for the study were interested in drawing. It was crucial that they already liked drawing because Lepper and Greene wanted to see what effect rewards would have when children were already fond of the activity. Expected reward. In this condition children were told they would get a certificate with a gold seal and ribbon if they took part. Surprise reward. In this condition children would receive the same reward as above but, crucially, weren’t told about it until after the drawing activity was finished. No reward. Children in this condition expected no reward, and didn’t receive one. As you can see the expected reward had decreased the amount of spontaneous interest the children took in drawing (and there was no statistically significant difference between the no reward and surprise reward group). 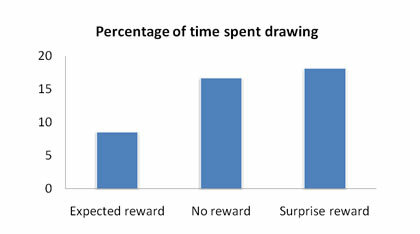 So, those who had previously liked drawing were less motivated once they expected to be rewarded for the activity. In fact the expected reward reduced the amount of spontaneous drawing the children did by half. Not only this, but judges rated the pictures drawn by the children expecting a reward as less aesthetically pleasing. It’s not only children who display this kind of reaction to rewards, though, subsequent studies have shown a similar effect in all sorts of different populations, many of them grown-ups. In one study smokers who were rewarded for their efforts to quit did better at first but after three months fared worse than those given no rewards and no feedback (Curry et al., 1990). Indeed those given rewards even lied more about the amount they were smoking. Rewards have even been found to make people less creative and worse at problem-solving. So, what’s going on? The key to understanding these behaviours lies in the difference between intrinsic and extrinsic motivation. When we do something for its own sake, because we enjoy it or because it fills some deep-seated desire, we are intrinsically motivated. On the other hand when we do something because we receive some reward, like a certificate or money, this is extrinsic motivation. The children were chosen in the first instance because they already liked drawing and they were already intrinsically motivated to draw. It was pleasurable, they were good at it and they got something out of it that fed their souls. Then some of them got a reward for drawing and their motivation changed. Before they had been drawing because they enjoyed it, but now it seemed as though they were drawing for the reward. What they had been motivated to do intrinsically, they were now being given an external, extrinsic motivation for. This provided too muchjustification for what they were doing and so, paradoxically, afterwards they drew less. This is the overjustification hypothesis for which Lepper and Greene were searching and although it seems like backwards thinking, it’s typical of the way the mind sometimes works. We don’t just work ‘forwards’ from our attitudes and preferences to our actions, we also work ‘backwards’, working out what our attitudes and preferences must be based on our current situation, feelings or actions (see also: cognitive dissonance). Not only this but rewards are dangerous for another reason: because they remind us of obligations, of being made to do things we don’t want to do. Children are given rewards for eating all their food, doing their homework or tidying their bedrooms. So rewards become associated with painful activities that we don’t want to do. The same goes for grown-ups: money becomes associated with work and work can be dull, tedious and painful. So when we get paid for something we automatically assume that the task is dull, tedious and painful—even when it isn’t. This is why play can become work when we get paid. The person who previously enjoyed painting pictures, weaving baskets, playing the cello or even writing blog posts, suddenly finds the task tedious once money has become involved. Yes, sometimes rewards do work, especially if people really don’t want to do something. But when tasks are inherently interesting to us rewards can damage our motivation by undermining our natural talent for self-regulation. The subtle signals that—thank the heavens—decisions are being made and how long the wrap-up will last. Until now people have been gathering around tables and whiteboards without properly understanding what is going on in ‘The Meeting’. Perhaps that’s why so many of them feel like a complete waste of time. As ‘The Meeting’ stretches out, participants start to feel lost, adrift, confused and unsure of the point. But now, thanks to an analysis of 95 meetings by researchers at MIT, we understand this strange beast a little better (Kim & Rudin, 2013). ‘The Meeting’, it seems, sends out little clues about what stage it’s at through the language of those at ‘The Meeting’. Although it sounds incredible, by close textual analysis of the words being used, you can tell when a decision is being made. Usually, of course, decisions are avoided at all costs in ‘The Meeting’ in case anyone has to actually do anything as a result of ‘The Meeting’. The question is, then, how can you persuade other people to reach one of these mythical ‘decisions’ which we hear so much about, yet which are so elusive in ‘The Meeting’? The researchers argue that top of the potential list comes the word ‘yeah’. Apparently when people start their utterances with ‘yeah’, this is a particularly good signal that ‘The Meeting’ is creeping ever-so-slowly towards this so-called ‘decision’. OK, it’s a miracle and ‘the meeting’ has made its ‘decision’, now, how long ’till I can get out of here? Not so fast, now we’ve got the wrap-up. The MIT researchers found that how long the wrap-up lasts depends on how long it’s taken to reach a decision. Once ‘The Meeting’ was over 14 minutes, the longer it was, the shorter the wrap-up. After the decision was made, people in ‘The Meeting’, if it was 14 minutes long, took 18 further minutes to wrap-up. But, if ‘The Meeting’ went to 35 minutes, the wrap-up normally only lasted about 10 minutes. Please send your results to MIT, not me. An award-winning social psychology experiment reveals why we often fail to bargain effectively with each other. Bargaining is one of those activities we often engage in without quite realising it. It doesn’t just happen in the boardroom, or when we ask our boss for a raise or down at the market, it happens every time we want to reach an agreement with someone. This agreement could be as simple as choosing a restaurant with a friend, or deciding which TV channel to watch. At the other end of the scale, bargaining can affect the fate of nations. Big-scale or small-scale, bargaining is a central part of our lives. Understanding the psychological processes involved in bargaining can provide us with huge benefits in our everyday lives. In a classic, award-winning series of studies, Morgan Deutsch and Robert Krauss investigated two central factors in bargaining: how we communicate with each other and how we use threats (Deutsch & Krauss, 1962). To do this, they used a game which forces two people to bargain with each other. Although Deutsch and Krauss used a series of different conditions – nine in fact – once you understand the basic game, all the conditions are only slight variations. Before the experiment proper starts, the researcher explains that you’ll be playing a game against another participant. In the game you will run a trucking company. The object of the game is the same as a real trucking company: to make as much money as possible. Like the real-life trucking company you have to deliver as many of your goods as possible to their destination in the shortest possible time. But in this game you only have one starting point, one destination and one competitor. It looks like a pretty simple game. The road map your one truck has to travel across presents you with a dilemma. You are the ‘Acme’ trucking company and your fellow participant is the ‘Bolt’ trucking company, although both of you have an identical problem. Have a look below. As you’ll see there are two possible routes you can take from the start to your destination: the short and the long. Remember, time is money, so the longer it takes you to get to your destination, the less profit you make, which is the aim of the game. Unfortunately the short route has a major shortcoming: it is one-way. Only one of you can travel down it at a time towards your destination. It seems you’ll be forced to work out some agreement with your unknown rival to share this one-way route so that you can both make money. How you’ll do this is another mystery, though, as there is going to be no communication between the two of you during the experiment. You are to be seated in a cubicle from where you’ll only be able to see the control box for your ‘truck’ and the experimenter. You are to be given one method of communication with your rival, albeit indirect communication. Each of you controls a gate at your own end of the one-way road. The gate, though, can only be closed when your truck is on the main route. This will be your threat. It is reinforced by the experimenter that you are out to make as much money as you can for yourself – the other person’s profit is not a concern. Once the experimenter sets you off, it soon becomes clear you’re not going to make much money at all. In the first of 20 trials, both you and your rival shut your gates, forcing both trucks onto the alternative route. This is 50% longer and means you make a loss on the trip as a whole. In the second trial your trucks meet head-on travelling up the one-way road. You both have to reverse, costing you time and money. The rest of the trials aren’t much better. Occasionally you make a profit on a trip but more often than not it’s a bust. You spend more time on the long route or reversing than you do chugging happily along the main route making money. At the end of the experiment, the researcher announces how much profit you made. None. In fact you made a crippling loss. Perhaps trucking companies aren’t so easy to run. You find out later that you were in one of three experimental conditions. 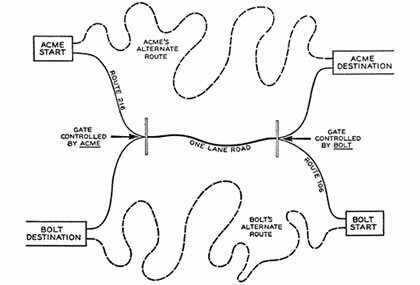 The only differences in the other two conditions were that in one there were no gates at either end of the one-way road. In the other there was only one active gate controlled by one player. Before I tell you the results of the other two conditions, try to guess. One condition, which you’ve taken part in, contained bilateral threat – you could both threaten each other. One condition had unilateral threat – only one could threaten the other. And the final condition had no threat at all. What was the order of profit? In fact it turns out that your condition, of bilateral threat, made the least profit when both participant’s scores were added up. The next most profitable was the unilateral threat condition, while the most profitable overall was the no-threat condition. Here’s the first rather curious result. While the person who had the threat – control of the gate – in the unilateral condition did better than the person who didn’t, they were still better off, individually and collectively, than if they both had threats. What this experiment is showing is that the availability of threats leads to worse outcomes to the extent that unilateral threat is preferable to bilateral threat to both parties. But surely a little communication goes a long way? You weren’t allowed to talk to the other participant in this experiment, so your trucks had to do the talking for you. Bargaining is all about reaching a compromise through negotiation – surely this should help? To test the effect of communication Deutsch and Krauss (1962) set up a second experiment which was identical in all respects to the first except participants were given headphones to talk to each other. Here’s the next curious result: allowing the two participants to communicate with each other made no significant difference to the amount of money each trucking company made. In fact the experimenters found no relationship between words spoken and money made. In other words those who communicated more did not manage to reach a better understanding with each other. Like the experimenters themselves, I find this result surprising. Surely allowing people to communicate let’s them work out a way for them both to make money? And yet this isn’t what happened in the experiment at all. Instead it seems that people’s competitive orientation was stronger than their motivation to communicate. On the other hand, perhaps something specific to the situation in this experiment is stopping people talking? Participants in the second study reported that it was difficult to start talking to the other person, who was effectively a stranger. As a result they were considerably less talkative than normal. Could it be that it was this situational constraint that meant little talking, and therefore little bargaining was going on? Deutsch and Krauss decided to test the effect of forced communication in their third experiment. Again the procedure is the same as last time but now participants are instructed that on each of the 20 trials they have to say something. If they don’t talk on one of the trials they are gently reminded by the experimenter to do so. They are told they can talk about whatever they like, as long as they say something. The results finally showed some success for communication. Performance in the one-gate (unilateral threat) condition came close to that achieved in the ‘no-threat’ condition (remember the no-threat condition has the best outcomes). Forced communication didn’t have much effect on the ‘no-threat’ condition when compared with no communication, and neither did it improve the bilateral threat condition much. It still seems that people are so competitive when they both have threats it’s very difficult to avoid both sides losing out. The most surprising finding of this study is how badly people do under conditions of bilateral threat. In this experiment not even forcing communication can overcome people’s competitive streaks. Deutsch and Krauss provide a fascinating explanation for this. Imagine your neighbour asks you to water their plants while they’re on holiday Socially, it looks good for you if you agree to do it. On the other hand if they ask you to water their plants otherwise they’ll set their TV on full blast while they’re on holiday, it immediately gets your hackles up. Suddenly you resent them. Giving in when there is no threat is seen by other people as pro-social. Duress, however, seems to make people dig in their heels. Before drawing some general conclusions from these studies, we should acknowledge the particular circumstances of this research. Deutsch and Krauss’s experiment covers a situation in which bargaining is carried out under time pressure. Recall that the longer participants take to negotiate, the less money they make. In real life, time isn’t always of the essence. The present game also has a relatively simple solution: participants make the most profit if they share the one-way road. In reality, solutions are rarely that clear-cut. Finally, our participants were not professional negotiators, they were clerical and supervisory workers without special training. Despite these problems the trucking game has the advantage of being what game theorists call a non-zero-sum game. In other words if you win, it doesn’t automatically mean the other person loses. When you total the final results, as you sometimes can in a financial sense, they don’t add to zero. In real life many of the situations in which we find ourselves are of this nature. Cooperation can open the way to more profit, in financial or other form, for both parties. Cooperative relationships are likely to be much more beneficial overall than competitive relationships. Before you go ‘duh!’, remember that increasing proportions of the world’s societies are capitalist. Deutsch and Krauss’s experiment clearly shows the friction caused by competitive relationships, such as those encouraged by capitalism. I’m not saying capitalism is bad, I’m just saying competition isn’t always good. This simple fact is often forgotten. Just because people can communicate, doesn’t mean they will – even if it is to their advantage. Forcing parties to communicate, even if they already have the means to communicate, encourages mutually beneficial outcomes. In competitive relationships, communication should be aimed at increasing cooperation. Other methods will probably create more heat than light. Threats are dangerous, not only to other’s interests, but also to our own. Remember all these the next time you are bargaining with your partner over a night out, about to shout a threat at a motorist blocking your path on a one-way road, or even involved in high-level political negotiations between warring factions with nuclear capabilities. It could save you, and the other side, a lot of trouble. This classic social psychology experiment shows how little excuse people need to form into groups and start discriminating against others. People’s behaviour in groups is fascinating and frequently disturbing. As soon as humans are bunched together in groups we start to do odd things: copy other members of our group, favour members of own group over others, look for a leader to worship and fight other groups. Just glance at Sherif’s Robbers Cave experiment for proof of how easy it is to provoke war between groups. But think about the types of groups you belong to, and you’ll realise they differ dramatically. Some groups are more like soldiers in the same unit or friends who have known each other from childhood. Long-standing, tight-knit, protecting each other. Perhaps it’s not surprising people in these groups radically change their behaviour, preferring members of their own group over others in many ways. Other groups, though, are much looser. Supporters of a large sports club, for example, or work colleagues only together on a project for a few months or even a group of people in an art gallery appreciating a painting. It seems impossible that people stood together for only 30 seconds to look at a painting can be said to form a group in any measurable way. Surely it’s too fleeting, too ephemeral? This is exactly the type of question social psychologist Henry Tajfel and colleagues set out to answer (Tajfel et al., 1971). They believed it was possible for a group, along with its attendant prejudices, to form at the drop of a hat. In fact they thought a group could form even when there was no face-to-face contact between members, none of the people knew each other and their ‘group’ behaviour had no practical consequences. In other words they had absolutely nothing to gain (or lose) from this barely existent group. Tajfel and colleagues came up with a neat solution for testing their idea. Participants, who were 14 and 15 year-old boys, were brought into the lab and shown slides of paintings by Klee and Kandinsky. They were told their preferences for the paintings would determine which of two groups they would join. Of course, this was a lie designed to set up the idea of ‘us’ and ‘them’ in their minds. The experimenters wanted two groups of boys with not the faintest idea who was also in their own group or what the grouping meant or what they had to lose or gain. After this setup, the boys were taken to a cubicle, one at a time. Each was then asked to distribute virtual money to the other members of both groups. The only information they had about who they were giving it to was a code number for each boy and that boy’s group membership. To obtain maximum joint profit? For maximum ingroup (own group) profit? For maximum difference between groups? Using favouritism? This involves a combination of maximum ingroup profit and maximum difference? From the way the virtual money was distributed, the boys did indeed demonstrate the classic behavioural markers of group membership: they favoured their own group over the other. And this pattern developed consistently over many, many trials and has subsequently been replicated in other experiments in which groups were, if you can believe it, even more minimal. When I first came across this experiment, my first reaction was to find it startling. Remember, the boys had no idea who was in their group ‘with them’ or who was in the other group. But, the most puzzling aspect of this experiment is that the boys had nothing whatsoever to gain from favouring their own group – there didn’t seem to be anything riding on their decisions. Out in the real world there’s a good reason to favour your own group – normally it is also advantageous to yourself. You protect yourself by protecting others like you. What Tajfel argued, though, was that there was something riding on the decisions the boys made, but it was something very subtle, yet incredibly profound. Tajfel argued that people build their own identities from their group memberships. For example, think of each of the groups you belong to: say at work, or within your family. Part of who you are is probably defined by these groups. Putting it the other way around: the nature of your group memberships define your identity. As our group membership forms our identity, it is only natural for us to want to be part of groups that are both high status and have a positive image. Crucially though, high status groups only have that high status when compared to other groups. In other words: knowing your group is superior requires having a worse group to look down upon. Seen in the light of social identity theory, then, the boys in the experiment do have a reason to be selfish about the allocation of the virtual cash. It is all about boosting their own identities through making their own group look better. The participant’s behaviour can be explained by simple economic self-interest. But: in another experiment only symbols were used rather than ‘virtual’ money and the results were the same. The participants were responding to what they thought the experimenters wanted (psychologists call this ‘demand characteristics’). But: Tajfel argues it is unclear to the participants what the experimenters wanted. 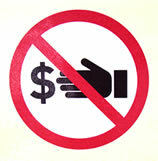 Recall that the rules for distributing money frequently changed. Also, the participants were encouraged to think that choosing whose paintings they liked (the ‘first’ experiment) was unrelated to the allocation of virtual money (the ‘second’ experiment). Despite these criticisms, Tajfel and colleagues’ findings have stood the test of time. The experiment, or something like it, has been repeated many times with different variations producing much the same results. Social identity theory states that our identities are formed through the groups to which we belong. As a result we are motivated to improve the image and status of our own group in comparison with others. Tajfel and colleagues’ experiment shows that group membership is so important to us that we join the most ephemeral of groups with only the slightest prompting. We will then go out of our way to make our own group look better compared to others. The simple fact of how important group membership is to us, and how easily we join groups, often without realising it, is both a subtle and profound observation about human nature. This study shows that many of us will deny our own senses just to conform with others. We all know that humans are natural born conformers – we copy each other’s dress sense, ways of talking and attitudes, often without a second thought. But exactly how far does this conformity go? Do you think it is possible you would deny unambiguous information from your own senses just to conform with other people? Have a look at the figure below. 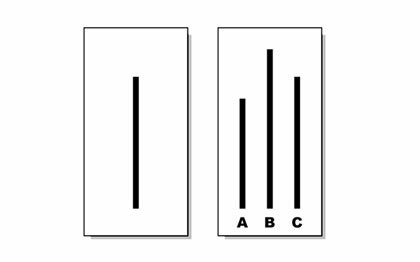 Compare the line on the left with the three lines on the right: A, B & C. Which of these three lines is the same length as the lonesome line on the left? It’s obviously C. And yet in a classic psychology experiment conducted in the 1950s, 76% of people denied their own senses at least once, choosing either A or B. What kind of strong-arm psychological pressure tactics made them do this? The fascinating thing about this experiment was that its creator, renowned psychologist Solomon Asch, set out to prove the exact opposite. A previous experiment by Muzafer Sherif (see his well-known Robbers Cave experiment) had found that when people were faced with making a judgement on an ambiguous test, they used other people’s judgements as a reference point. This makes perfect sense. If I’m not sure about something, I’ll check with someone else. But this is only when I’m not sure. The situation is quite different when I have unambiguous information, such as when I can clearly see the answer myself. Other people’s judgement should then have no effect – or at least that’s what Asch thought. To test his theory he brought male undergraduates, one at a time, into a room with eight other people who were passed off as fellow participants (Asch, 1951). They were then shown three lines with another for comparison, similar to the figure above. Participants were asked to call out which line – A, B or C – was the same length as the reference line. This procedure was repeated 12 times with participants viewing variations of the above figure. What the participants didn’t realise was that all the other people sat around the table were in on the game. They were all confederates who had been told by the experimenter to give the wrong answer. On half of the trials they called out the line that was too short, and on the other half the line that was too long. The real experimental participant, who knew nothing of this, was actually the sixth to call out their answer after five other confederates of the experimenter had given the wrong answer. 50% of people gave the same wrong answer as the others on more than half of the trials. Only 25% of participants refused to be swayed by the majority’s blatantly false judgement on all of the 12 trials. Over all the trials the average conformity rate was 33%. All felt anxious, feared disapproval from others and became self-conscious. Most explained they saw the lines differently to the group but then felt the group was correct. Some said they went along with the group to avoid standing out, although they knew the group was wrong. A small number of people actually said they saw the lines in the same way as the group. Asch himself found that if the participant only had to write down their answer (while others called theirs out) conformity was reduced to 12.5%. Deutsch and Gerard (1955) still found conformity rates of 23% even in conditions of high anonymity and high certainty about the answer. Those who are ‘conformers’ typically have high levels of anxiety, low status, high need for approval and often authoritarian personalities. Cultural differences are important in conformity. People from cultures which view conformity more favourably – typically Eastern societies – are more likely to conform. The variations on the original theme go on and on, examining many possible experimental permutations, but the basic finding still remains solid. While there’s no surprise that we copy each other, it’s amazing that some people will conform despite the evidence from their own eyes. Imagine how much easier it is to encourage conformity when ambiguity levels are much higher, as they often are in everyday life. Conformity itself is something of a mixed blessing. In many situations we need conformity. In fact, many aspects of our social lives would be much harder if we didn’t conform to a certain extent – whether it’s to legal rules or just to queuing in the post office. The dangers of conformity are only too well-known, just take a look at the implications of Milgram’s obedience experiments for a glimpse at what humans will do in the name of conformity. Sometimes it really is better if we think for ourselves rather than relying on what others say and do. How does conformity affect us all? It certainly bears considering how our own lives would be different if, one day, we decided not to conform, or even to suddenly start conforming. Would things get better or worse for you? Many people find their inability to conform is a real problem in their lives while others find it more difficult to break away and do their own thing. Stanley Milgram: Obedience to Authority Or Just Conformity? Sherif’s Robbers Cave experiment, a classic study of prejudice and conflict, has at least one hidden story. The typical retelling of Sherif’s classic Robbers Cave experiment highlights the resolution of intergroup prejudice, but recent interpretations suggest a darker conclusion that demonstrates the corrupting influence of power. The Robbers Cave experiment, a classic study of prejudice and conflict, has at least one hidden story. The well-known story emerged in the decades following the experiment as textbook writers adopted a particular retelling. With repetition people soon accepted this story as reality, forgetting it is just one version of events, one interpretation of a complex series of studies. As scholars have returned to the Robbers Cave experiment another story has emerged, putting a whole new perspective on the findings. In this experiment twenty-two 11 year-old boys were taken to a summer camp in Robbers Cave State Park, Oklahoma, little knowing they were the subjects of an experiment. Before the trip the boys were randomly divided into two groups. It’s these two groups that formed the basis of Sherif’s study of how prejudice and conflict build up between two groups of people (Sherif et al., 1961). When the boys arrived, they were housed in separate cabins and, for the first week, did not know about the existence of the other group. They spent this time bonding with each other while swimming and hiking. Both groups chose a name which they had stencilled on their shirts and flags: one group was the Eagles and the other the Rattlers. The two groups now established, the experiment moved into its second phase. For the first time the two groups were allowed to find out about each other and soon the signs of intergroup conflict emerged in the form of verbal abuse. A little name-calling wasn’t enough, though. The experimenters wanted to increase the conflict substantially. To do this they pitted the groups against each other in a series of competitions. This ratcheted up the antagonism between the two groups, especially once all the team scores were added up and the Rattlers won the overall trophy for the competitive activities. They didn’t let the Eagles forget it. The Rattlers staked their claim to the ball field by planting their flag in it. Later on each group started name calling at the other and singing derogatory songs. Soon the groups were refusing to eat in the same room together. With conflict between the groups successfully instigated, the experiment now moved into its final phase. Could the experimenters make the two groups kiss and make up? First of all they tried some activities in which the two groups were brought together, such as watching a film and shooting firecrackers, but neither of these worked. The experimenters then tried a new approach. They took the two groups to a new location and gave them a series of problems to try and solve. In the first problem the boys were told the drinking water supply had been attacked by vandals. After the two groups successfully worked together to unblock a faucet, the first seeds of peace were sown. In the second problem the two groups had to club together to pay for the movie they wanted to watch. Both groups also agreed on which movie they should watch. By the evening the members of both groups were once again eating together. The groups ‘accidentally’ came across more problems over the next few days. The key thing about each of them was that they involved superordinate goals: boys from both groups worked together to achieve something they all had an interest in. Finally all the boys decided to travel home together in the same bus. Peace had broken out all over. Sherif reached an important conclusion from this study, and other similar work carried out in the 1940s and 50s. He argued that groups naturally develop their own cultures, status structures and boundaries. Think of each of these groups of boys as like a country in microcosm. Each country has its own culture, its government, legal system and it draws boundaries to differentiate itself from neighbouring countries. From these internal structures, the roots of conflict in both the groups of boys and between countries are created. One of the reasons Sherif’s study is so famous is that it appeared to show how groups could be reconciled, how peace could flourish. The key was the focus on superordinate goals, those stretching beyond the boundaries of the group itself. It seemed that this was what brought the Rattlers and the Eagles back together. What is often left out of the familiar story is that it was not the first of its type, but actually the third in a series carried out by Sherif and colleagues. The two earlier studies had rather less happy endings. In the first, the boys ganged up on a common enemy and in the second they ganged up on the experimenters themselves. How does this alter the way we look at the original Robbers Cave experiment? Michael Billig argues that when looking at all three studies, Sherif’s work involves not just two groups but three, the experimenters are part of the system as well (Billig, 1976). In fact, with the experimenters included, it is clear they are actually the most powerful group. Much of the conflict between the two groups of boys is orchestrated by the experimenters. The experimenters have a vested interest in creating conflict between the two groups of boys. It was they who had the most to lose if the experiment went wrong, and the most to gain if it went right. The three experiments, then, one with a ‘happy’ ending, and two less so, can be seen in terms of the possible outcomes when a powerful group tries to manipulate two weaker groups. Sometimes they can be made to play fair (experiment three), sometimes the groups will unite against a common enemy (experiment one) and sometimes they will turn on the powerful group (experiment two). For psychologist Frances Cherry it is the second experiment which makes this analysis plausible. When the boys rebel against the experimenters, they showed understanding of how they were being manipulated (Cherry, 1995). Although the Robbers Cave experiment is, in some sense, the ‘successful’ study, taken together with the other two it is more realistic. In reality, Cherry argues, it is more often the case that groups hold unequal amounts of power. Unequal levels of power between groups fundamentally changes the dynamic between them. Whether it’s countries, corporations, or just families, if one group has more power, suddenly the way is open for orchestrated competitions and cooperation, not to mention manipulation. Manipulating other groups, though, is a dangerous game, and weaker groups don’t always play by the rules set for them. Perhaps this is the more subtle, if less enduring message of the Robbers Cave experiment and its supposedly less successful predecessors. Why backup plans (sometimes) motivate, even if you never use them. Before reading a new article in the Journal of Personality and Social Psychology, I never thought of a backup plan as something that might be motivating in itself. Surely all the benefit of a backup plan accrues when the main plan goes wrong and there’s something to fall back on? While coming up with a ‘plan b’ might be necessary, I always thought of it more as a chore. (Ho-hum now I’ve made my main plan, instead of getting started, I’ve got to spend more time thinking about an alternative plan). But when you start to think about it, backup plans don’t just make sense as, well, backup plans, but also as a means of driving you forward at the precarious early stages of a project. That’s because our motivation to succeed is heavily tied in with our expectations of success. No one drives to a shop that they are pretty sure is closed. What feeds our motivation is knowing that we have a good chance of achieving the goal. It sounds obvious but it leads to a non-obvious conclusion. It means that a little more time spent thinking about a backup plan or alternative ways to get where you’re going will help you, even if you never have to actually use them. A new study demonstrates this nicely using a coffee shop customer loyalty programme (Huang & Zhang, 2013). Participants were told they had to get a card stamped six times to get a free coffee. One group in the study, though, was manipulated into thinking that they had more ways of collecting stamps than the other group. So, some people thought there were more ways of reaching their goal than others. Again: actually there weren’t more ways of getting stamps—the experimenters were trying to remove the better known advantage of a backup plan (that you might need to use it) and just look at the effects on motivation of thinking there are more ways to achieve your goal. What they found was that those who thought there were more alternatives for collecting the loyalty stamps were almost twice as likely to join the programme. They also checked this out in different contexts and got the same results again and again. When people thought there were more opportunities to donate blood, write reviews of movies, or memorise word lists, they demonstrated more motivation. Backup plans, then, can sometimes have a motivating effect, but not always; there is a twist in the tail. What about when you’re half-way through your project or towards that goal of yours? You’re starting to feel very confident that you will get there. What kind of effect do more alternatives for reaching your goal have then? When Huang and Zhang looked at this, they found the effect reversed. When people already had five stamps on their loyalty card, more ways to get the sixth and final one actually de-motivated them. Similarly when people thought the blood drive had almost reached its target, rather than being right at the beginning, fewer options lowered their motivation to donate. This might seem a little strange, but it chimes with other research that has looked at the psychology of choices. Generally speaking, choices are more pleasurable at the beginning of a project. But once we’re on the road to success, options go from being a pleasure to a pain. So backup plans, or alternative means of achieving our goals, start out reassuring, but end up as distractions. This means that the use of options in motivation should be arranged like a funnel. At the start (the wide end), more options pump up initial motivation; but later on, when success is all but assured, options slow us down. Once the end is in sight (the narrow end), it’s far better to forget about backup plans and push on for victory. Just the same is true when motivating others: give people options to get them interested at the start, but towards the end, they should be reduced to avoid distraction.